Artistic representation of the potentially habitable Super-Earth Gliese 832 c against a stellar nebula background. Credit: Planetary Habitability Laboratory at the University of Puerto Rico, Arecibo. Credit: NASA/Hubble, Stellarium. Gliese 832c was spotted by an international team of astronomers, led by Robert A. Wittenmyer from UNSW Australia. They used high-precision radial-velocity data from HARPS-TERRA, the Planet Finder Spectrograph and the UCLES echelle spectrograph. This star is already known to have one additional planet, a cold Jupiter-like planet, Gliese 832 b, discovered in 2009. The newly found super-Earth has a mass at least five times that of Earth's and the astronomers estimate it receives about the same average energy as Earth does from the Sun. "The planet might have Earth-like temperatures, albeit with large seasonal shifts, given a similar terrestrial atmosphere," says a press release from the Planetary Habitability Laboratory. "A denser atmosphere, something expected for Super-Earths, could easily make this planet too hot for life and a 'Super-Venus' instead." Using the Earth Similarity Index (ESI)—a measure of how physically similar a planetary mass object is to Earth, where 1 equals the same qualities as Earth—Gliese 832 c has an ESI of 0.81. This is comparable to Gliese 667C c (ESI = 0.84) and Kepler-62 e (ESI = 0.83). 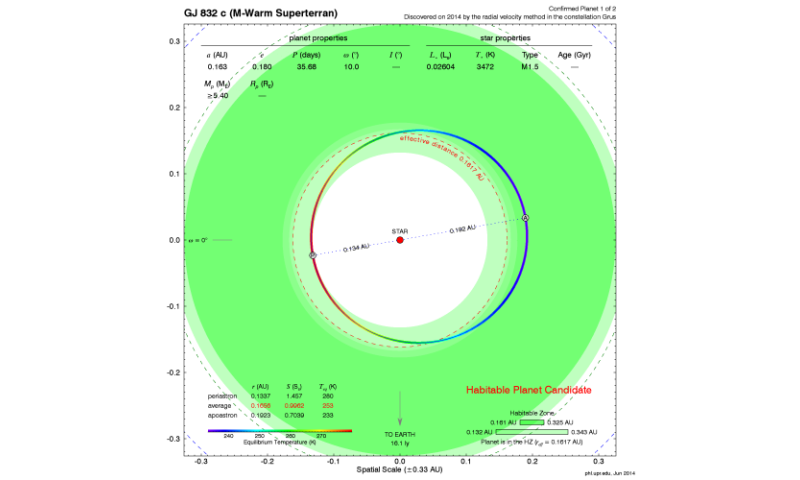 Orbital analysis of Gliese 832 c, a potentially habitable world around the nearby red-dwarf star Gliese 832. Gliese 832 c orbits near the inner edge of the conservative habitable zone. Its average equilibrium temperature (253 K) is similar to Earth (255 K) but with large shifts (up to 25K) due to its high eccentricity (assuming a similar 0.3 albedo). Credit: Planetary Habitability Laboratory. "This makes Gliese 832c one of the top three most Earth-like planets according to the ESI (i.e. with respect to Earth's stellar flux and mass) and the closest one to Earth of all three, a prime object for follow-up observations. However, other unknowns such as the bulk composition and atmosphere of the planet could make this world quite different to Earth and non-habitable." In their paper, Wittenmyer and his colleagues noted that while Solar Systems like our own appear—so far—to be rare, the Gliese 832 system is like a scaled-down version of our own Solar System, with an inner potentially Earth-like planet and an outer Jupiter-like giant planet. They added that the giant outer planet may have played a similar dynamical role in the Gliese 832 system to that played by Jupiter in our Solar System. Certainly, astronomers will be attempting to observe this system further to see if any additional planets can be found. 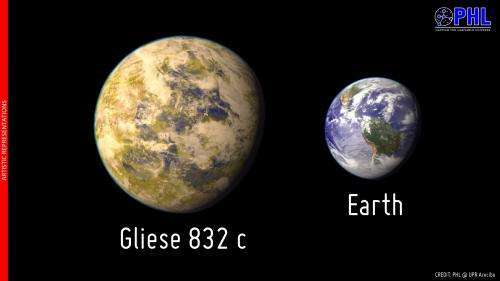 Artistic representation of the potentially habitable exoplanet Gliese 832 c as compared with Earth. 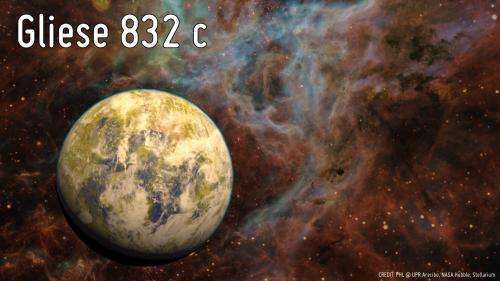 Gliese 832 c is represented here as a temperate world covered in clouds. The relative size of the planet in the figure assumes a rocky composition but could be larger for a ice/gas composition. Credit: Planetary Habitability Laboratory. If you're interested in trying to see this star, here's our guide on red dwarf stars that are visible in backyard telescopes.